Easy integration and maximum productivity in demanding print environments. 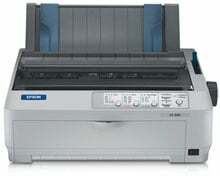 A full-featured, high-value performer, the Epson FX-890 offers the durability and ease of use required for critical daily print requirements. This 9-pin, narrow-carriage workhorse boasts an MTBF rating of 20,000 power-on hours (POH) and speeds of up to 680 cps. Engineered for seamless integration into virtually any system, it provides standard Parallel, USB, and additional connectivity options. And, it includes Epson Remote Configuration Manager software for easy printer setup and simple setting selections via most Windows operating systems. Ideal for rugged environments, this robust printer is the perfect drop-in replacement for the Epson FX-880/880+/980 or Okidata Microline 320/320 Turbo. Ribbon (Black - Single Cartridge) for the FX-890. Single ribbon. The Epson C11C524001 is also known as Epson POS Products	EPS-C11C524001	.